PCT Mapping project for Halfmile’s maps! We are very excited to announce that we will be helping out with mapping efforts of the PCT this year. We were contacted by an old friend and trail angel from our hike on the Appalachian Trail. His trail name is White Jeep, since he would drive a white jeep as a support vehicle for his wife, Seminole while she hiked the Appalachian Trail in 2010. He would meet her at road crossings and give out delicious treats to other hikers like ourselves as well. Since 2010, White Jeep has been involved with mapping efforts on the PCT. 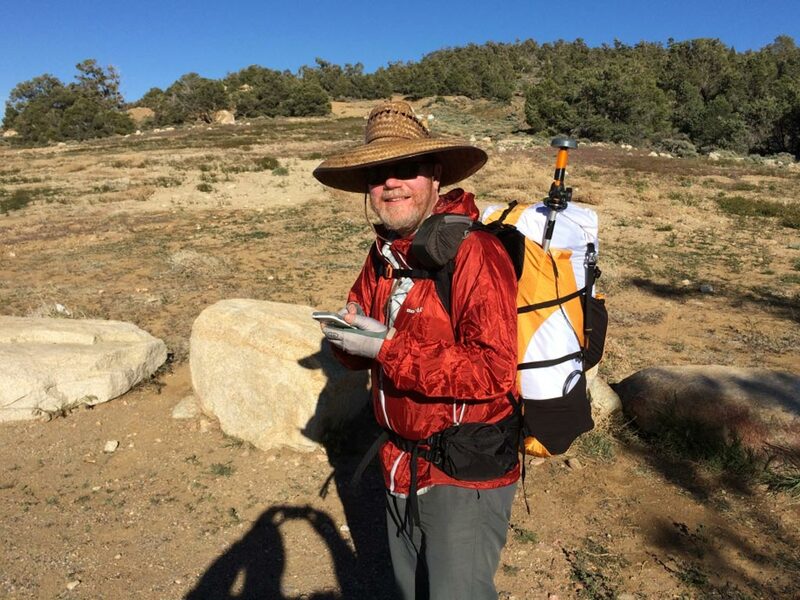 He has written and maintained the Halfmile apps that many hikers use on their smartphones. He has recently been working on the technical side to help acquire and process trail data with the help of Halfmile and the PCTA. This year Halfmile is hiking north with a custom GPS rig that will yield on average a 1 meter accuracy. When White Jeep contacted us to ask if we would be interested in helping with the mapping efforts, we were very excited! By hiking with another custom GPS rig in the southbound direction, two sets of data will be collected for the whole trail, and we will likely cover each other’s gaps due to snow, or poor satellite positioning. Click here for an article that was recently published in the PCTA blog about this project, and for more details on the custom setup. Once the data has been collected by us hikers, this will be the first time that they will have a full track of the PCT where the accuracy and source of each data point is known, and then they are hoping to have the US Forest Service, which provides much of the funding for the PCTA, adopt the final version of this track as the authoritative definition of the trail. It was interesting to me to hear about some of the consequences of having such an highly accurate definition of the trail. For example, there may be times when the newly measured track does not go exactly as agreed through one of the 800 private land easements, and the PCTA will have to deal with some of those consequences. Also, this map will be published and therefore distributed to companies such as Garmin, Google and Delorme, since their current data on the PCT is often far from accurate. This is all part of the plan, and the PCTA is on board. We are very excited to be part of this project. We will be getting our GPS unit with the stylish antenna once we get to Cascade Locks, Oregon, where we will be out of most of the snow we will encounter (it makes no sense for us to track our route through the snow where we will often have no idea if we’re on the trail or not). Besides feeling like we’re able to give something back to the wonderful hiking community by helping with this effort, we also feel like this has given our hike more of a sense of purpose. We’re not simply hiking to Mexico anymore. We’re mapping the PCT. For everyone! This entry was tagged Backpacking, pacific crest trail, Pacific Crest Trail 2014, Pacific Crest Trail Blog, Pacific Crest Trail South bound, pct, pct 2014, PCT blog, PCT southbound, thru-hike. Bookmark the permalink. That is super !!! So next year when it’s my turn I will know where I am! Thanks!! Very cool! I met Halfmile and Deb on my sobo section hike a few weeks ago. Thanks for helping!